I ran across these while searching for some other data this morning and just had to share. 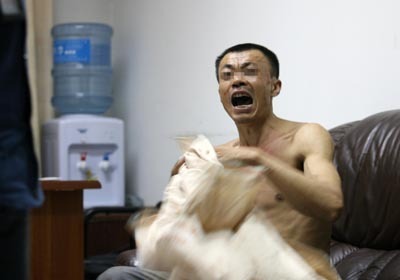 The China Daily blurb on this incident was presented as a photo gallery feature, not a bona fide news item, interestingly enough. 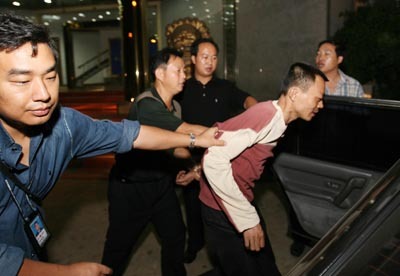 Here, the “aviation police” are said to be escorting Zeng out for evaluation at a mental hospital. Three questions: (1) Why are Zeng’s eyes blurred out in this photo and not the previous ones? ; (2) What company or team logo is that on the shirt he’s wearing, and will they have to pay him royalties for this? 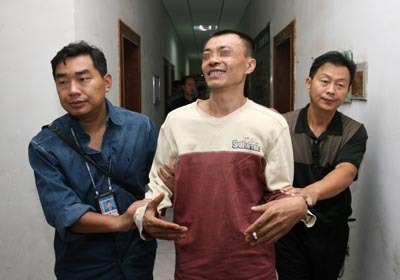 ; and (3) Is Zeng smiling now and not agitated because the police have let him have a cigarette (see his left hand)? A 15-year-old Singaporean girl was almost refused the right to board a plane at Guangzhou Baiyun International Airport on Monday due to her phone’s rather bizarre ring tone. The “voice” was soon found to be coming from the young Singaporean woman’s mobile phone. The girl was immediately required to delete the strange ring tone. She was allowed to board after getting a severe telling off from the airport security officials. That is nearly as dumb as what this guy did.